(Nanowerk News) With potential adverse health and environmental effects often in the news about nanotechnology, scientists in Arkansas are reporting that carbon nanotubes (CNTs) could have beneficial effects in agriculture. Their study, scheduled for the October issue of ACS Nano ("Carbon Nanotubes Are Able To Penetrate Plant Seed Coat and Dramatically Affect Seed Germination and Plant Growth"), a monthly journal, found that tomato seeds exposed to CNTs germinated faster and grew into larger, heavier seedlings than other seeds. That growth-enhancing effect could be a boon for biomass production for plant-based biofuels and other agricultural products, they suggest. Mariya Khodakovskaya, Alexandru Biris, and colleagues note that considerable scientific research is underway to use nanoparticles — wisps 1/50,000th the width of a human hair — in agriculture. The goals of “nano-agriculture” include improving the productivity of plants for food, fuel, and other uses. The scientists report the first evidence that CNTs penetrate the hard outer coating of seeds, and have beneficial effects. Nanotube-exposed seeds sprouted up to two times faster than control seeds and the seedlings weighed more than twice as much as the untreated plants. 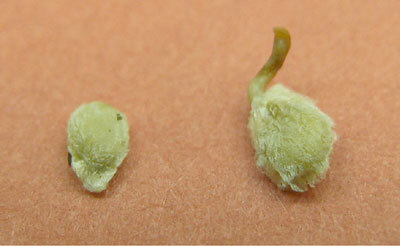 Those effects may occur because nanotubes penetrate the seed coat and boost water uptake, the researchers state. “This observed positive effect of CNTs on the seed germination could have significant economic importance for agriculture, horticulture, and the energy sector, such as for production of biofuels,” they add. We have covered this research in a previous Nanowerk Spotlight here: "Nanotechnology dramatically affects plant growth".